Go to www.pfcdonoragency.com to submit an application. Seeking amazing young women who are interested in providing the generous gift of egg donation. In return, you will receive $10,000 compensation for your time and effort. 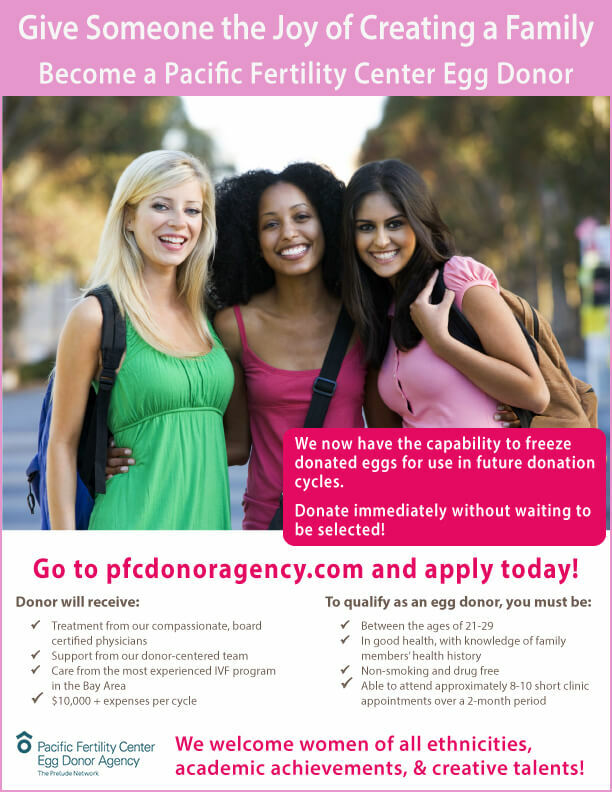 Pacific Fertility Center is actively recruiting egg donors for our fresh egg and frozen egg bank programs. With advances in egg freezing technology, we have the ability to freeze donated eggs for use in future donations. Donate immediately without waiting to be selected! Pacific Fertility Center is operated by physicians that have performed IVF procedures longer than any other program in the Bay Area. All care and coordination is provided in-house by our physician team and medical support staff.